Once you’ve had labneh alongside roasted meat, you’ll never want to do without it, said Clare Lattin and Tom Hill in Ducksoup: The Wisdom of Simple Cooking (Chronicle Books). At our restaurant in London, labneh appears again and again on the menu, because the strained salted yogurt—“a kind of yogurt cheese”—is so versatile and so easy to make and store. Cooked right, any stone fruit will do. Preheat oven to 400. Heat large grill pan until smoking. Rub lamb with oil; season with salt and pepper. Place in grill pan and cook 5 minutes on one side. (You may need to turn heat down; there will be a lot of smoke.) Turn lamb over and cook 5 minutes on other side. Using tongs, turn meat onto its side and cook edges 3 minutes each. Once all sides of meat have been browned, transfer to a large roasting pan and roast 16 to 18 minutes. Place an ovenproof frying pan over medium heat and add a dash of oil. Once oil is hot, add apricots; cook 5 minutes, shaking pan to move them, until skin starts to blister. Add thyme, transfer pan to oven, and roast 8 to 10 minutes, until fruit is cooked but still a bit firm. Set aside to cool. When meat is cooked, remove from oven and let rest 15 minutes, covered loosely with foil. Carve meat at about a 30-degree angle, creating triangular chunks. Arrange pieces on serving platter. 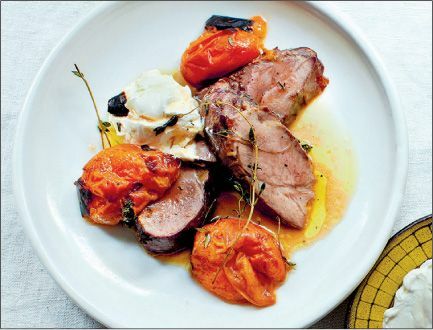 When apricots are cool enough to handle, tear open, pit, and place in and around lamb. Spoon on labneh, then squeeze on lemon juice. Drizzle with oil; season with a pinch of salt. Serves 4 to 6. To make labneh: For every 2 cups full-fat natural Greek yogurt, whisk in 1 tsp salt . Pour mixture into cheesecloth suspended over a bowl (you can also use a large coffee filter) to allow excess liquid to drip through. Depending how thick you want your labneh, leave overnight for mediumfirm or 3 days for super-firm. Store in olive oil with herbs.